And naturally...since River was in last year's Christmas mantle reveal...here he is again. 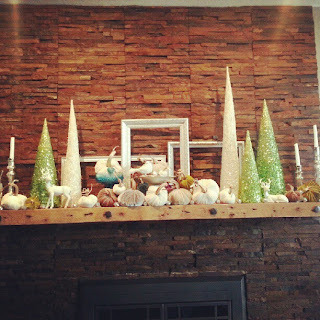 Speaking of last years mantle...it has been getting pinned like crazy on Pinterest this year! It is so cool to see your decor getting pinned an entire year after the fact still! It is quite possible I may be slightly obsessed with these pumpkins. Who wouldn't be? Fresh, delicate, yet hearty, handmade, organic stems, quality plush velvet, heirloom pieces...need I say more? I have been asked if I won these from one of the many giveaways that my friends at the LoveFeast Table have hosted...my reply...no. I purchased every single one of them. There are some things I would pay a lot of money for...but there are other things you know are just plain and simple quality and smart, beautiful design. I get joy out of supporting my friends Kristin & Chris Ann in their amazing adventure with their shop and blog. I like to give credit where credit is due....speaking of quality...Kristin & Chris Ann....quality people. Real, down to earth, would welcome you in with arms open. Sparkly deer, mercury glass candle holders, snowflake glass candle vase I decorated. 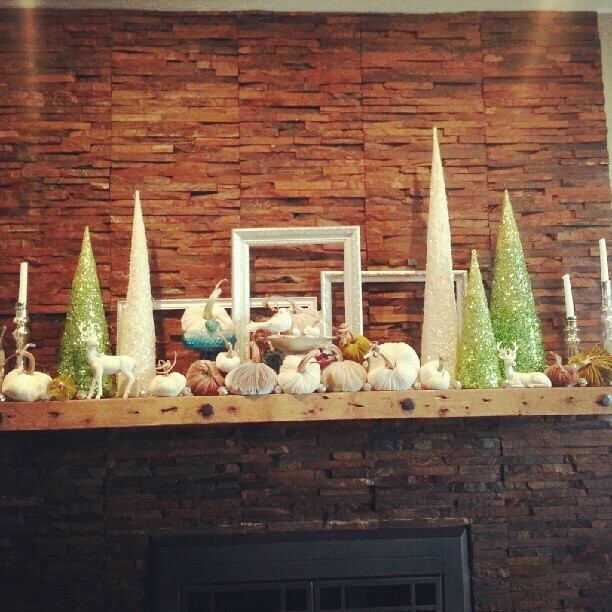 What is your favorite thing to decorate for Christmas? I'm pretty sure including pumpkin in Christmas decor is the coolest thing in the world. Ever. Until the end of time.